From Thursday, April 17-Saturday, April 20 the women’s club volleyball team will be competing at a national tournament in Denver, CO! 11 club members will be traveling to Denver to try and win another Division II National Title. The club holds two to other national titles from winning in 2015 in Kansas City, MO and in 2017 in Kansas City, MO. We will be competing against 48 other club teams from across the country in the three-day tournament. The team will be taking over the club sports Instagram account and posting daily. 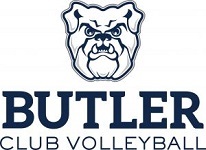 Make sure to follow the account @butlerclubsports for daily updates on both the men’s and women’s team. For more information about the tournament check out their website and for results stay tuned for our next blog post! We want to wish our fans and supports a huge thank you for helping us raise of $2000 for the club! The money will be going towards our trip to Denver, Colorado to compete for another Women’s Division II National title. Without this money our trip would not be possible! These season the A team and B team will be competing in a variety of tournaments. A team will be competing at Indiana University, Purdue University, and Ball State. B Team will be competing at Wright State University, Ball State University, and the University of Cincinnati. Check out the Schedule page for more information including dates and the results. We’re looking forward to a great second semester. Go Dawgs! This past weekend, both A team and B team competed in the Bulldog Fall Classic our first home tournament of the season. The A team received 2nd in Gold and the B team received 1st place in Silver. Great job ladies! We still have two more tournaments of the season, check out the Schedule page to learn more about our upcoming tournaments. We will be hosting an open gym on Wednesday, September 5th from 9:30-11:30pm in the HRC on Court 1. This is the perfect chance to come and see what club volleyball is all about! We will mostly be scrimmaging and playing some fun games. Tryouts will be held the following week on Monday, September 10th from 9:30-11:30pm and Wednesday, September 12th from 9:30-11:30pm, in the HRC. If you have any questions please feel free to reach out to me at lrhodes@butler.edu. 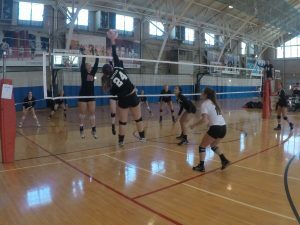 The Butler Women’s Club B team finished off their season this past weekend at a Ball State tournament. They fought hard and finished in the silver bracket, eventually losing to Western Michigan. They had great wins over teams such as Purdue C, IU B, and more. They are done for the year and helping the A team prepare for the National Tournament next week. 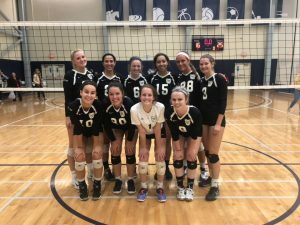 The club volleyball team will be hosting a spring semester tryout on Monday, January 29th from 9:30-11:30pm on Court 1 of the HRC. We encourage anyone to come tryout. We are a competitive team and are planning on competing in nationals mid April. 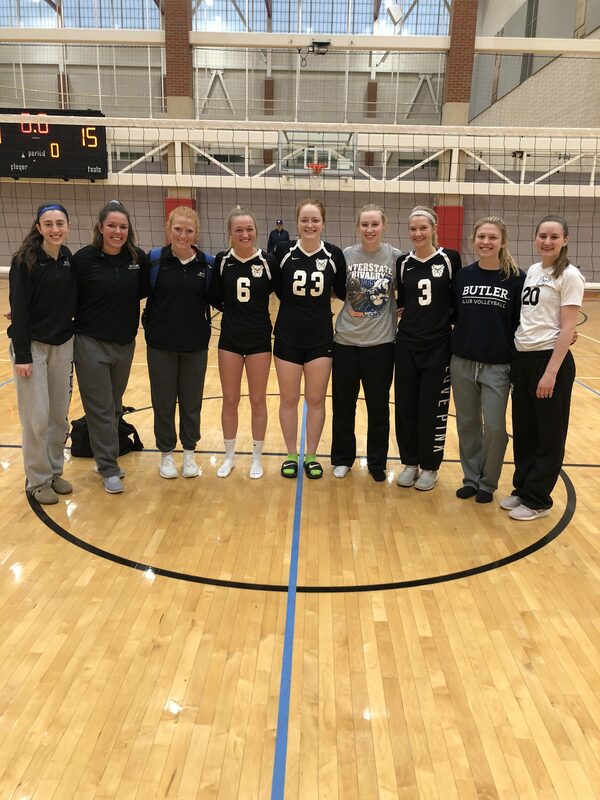 The Butler Women’s Club Volleyball team took home 7th place out of 15 teams at their last tournament of the fall semester! 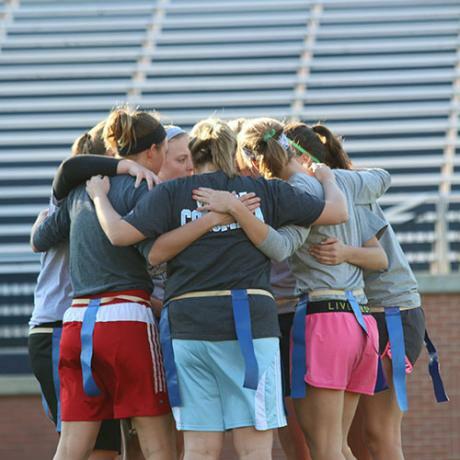 This past Saturday, Butler traveled to Indiana University to play against all Big 10 teams. Teams in attendance included Indiana University, University of Illinois, Michigan State, Purdue University, and Wisconsin. Both the A & B team did well during pool play. The B team fell in the first round of bracket play along with the A team who had a close game against IU. Congratulations to both teams for starting off the season well! The Dawgs are also saying a sad goodbye to senior Samantha Lilly, as this was her last semester playing for the women’s club team. Sam was a part of both National Championships as well as getting MVP! We will miss you Sam! 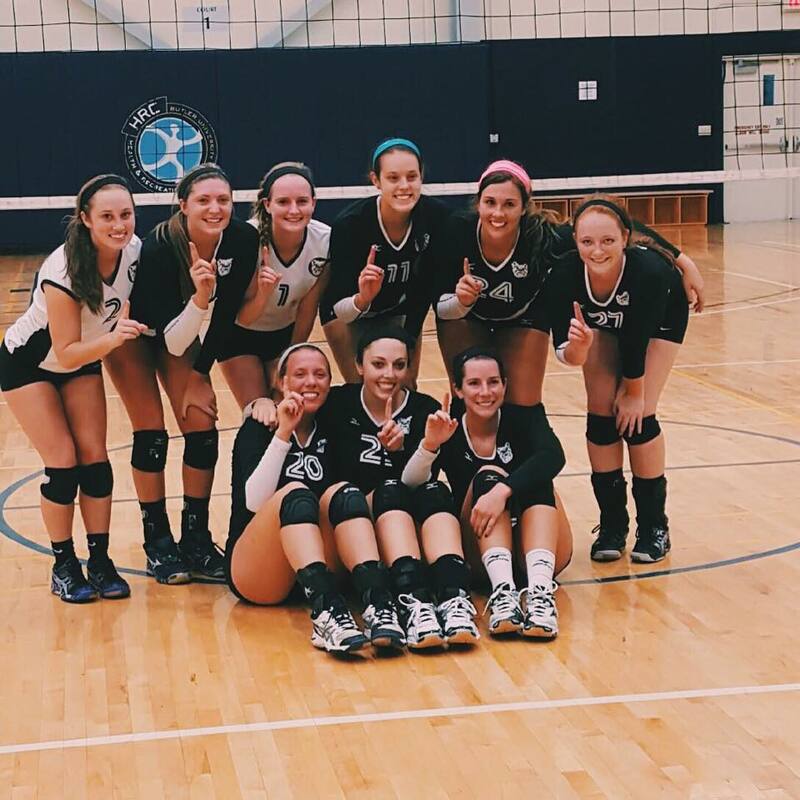 The Butler Women’s Club Volleyball team takes home first place at their first tournament of the year! This past Saturday, Butler hosted the Butler Fall Classic to kick off their season. Teams in attendance included Indiana University, Illinois State University, Indiana State University, Loyola, and Bellarmine. Both the A & B team did well during pool play. The B team faced off against Indiana A, Loyola A, and Illinois State B while the A team played Indiana State A, Indiana B, and Loyola B. The B team fell in the first round of bracket play while the A team advanced to the Championship against Loyola. Congratulations to both teams for starting off the season well! The Dawgs also competed at Purdue later in October. The Dawgs will next travel to Northwestern University on November 21st and Indiana University on December 5th! Follow us @BUWomensClubVB for live updates and more info! Check out why our players love our team! 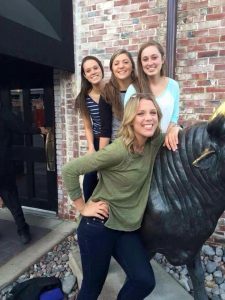 2 year Women’s Club Volleyball member, Maddie Reidy, wrote an amazing blog post about why she joined Women’s Club Volleyball and why she is so happy with that decision. Maddie is a great team player and has really improved over her time with the club. She makes everyone smile and we wouldn’t be the same without her! Thank you for your kind words about the team Maddie! We love ya! Maddie in front pictured with three of our other club members, Kennedy, Anna, and Suzie! Welcome back everyone! We are so excited to get started on another exciting year of volleyball! As a reminder to any interested, there will be an open gym tonight from 9-11pm in the HRC! Please come for as long as you like to shake off the rust before tryouts! Tryouts will be held on Wednesday, September 2nd and Thursday, September 3rd from 9-11pm in the HRC! Please contact our president, Kerry Risley (krisley@butler.edu), if you have any questions! We look forward to seeing you all there! 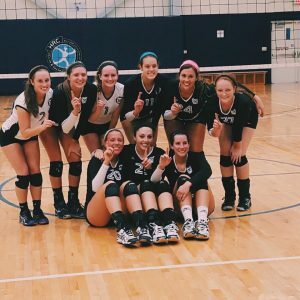 Interested in playing a club sport? 1 month ago by butlerhrc Check out this awesome event! 7 days ago by butlerhrc Don't miss out on the Open High Course TOMORROW! 1 month ago by butlerhrc Have you participated in any of the Office of Recreation and Wellness's programs and services in 2018-19? If so, give us your feedback! By taking the survey below you can then be eligible for a free massage at the HRC or $50 in Dawg Bucks! Link in Bio! 4 weeks ago by butlerhrc Looking for a fun new place to work? Become a High Course Facilitator! 3 days ago by butlerhrc Looking for a summer job? Check out this awesome opportunity! 2 months ago by butlerhrc Take the HRC and BUBEWell social media survey this week. It’s 1 minute or less! It will direct the future of hashtags and channels forever!!! (At least for Butler wellness) Link in bio.